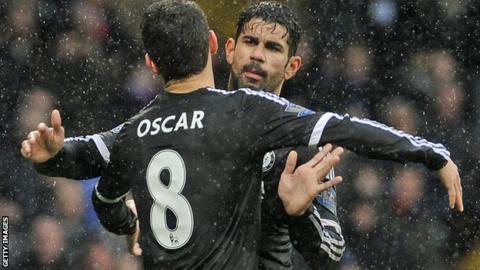 Chelsea midfielder Oscar has denied he was involved in a training-ground fracas with team-mate Diego Costa. The Telegraph reported the two players had to be separated following an "outrageous" challenge from Brazilian midfielder Oscar. But the 24-year-old wrote on Twitter that he would "never fight" his team-mate, described the Spain striker, 27, as "one of my best friends". Chelsea face League One side Scunthorpe in an FA Cup third-round tie on Sunday. Oscar may have easily brushed off the story, but for two Feyenoord players, reports of a training-ground scrap where a bit harder to deny. Netherlands international defender Miquel Nelom, 25, and midfielder Tonny Vilhena, 21, became embroiled in an almighty row on Thursday... in full view of photographers. Coach Giovanni van Bronckhorst understatedly described the spectacular disagreement as "not such a clever thing to happen when the press are standing next to the field".